In garment factories many Engineers and Managers feel that they have done everything to improve processes and working methods. They don't find further things (new and innovative) to work on next. You might be observed that improvement becomes stagnant after few years of working in a same factory. If you are feeling so, take a deep breath and be ready to read something that would gives you ideas. 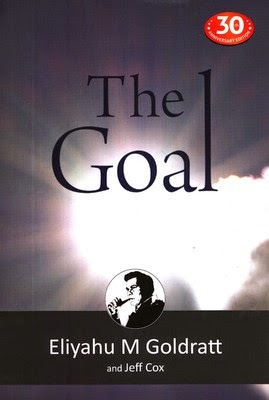 Yes, you need to read the book "The Goal: A Process of Ongoing Improvement"
Few days ago Mr. Keerthi Abe, Managing Director of SewEasy, reminded me about this book and ask me to add this book in the book list. I read this book twice - first time during my college days (at NIFT) and second time when I joined in a management consultancy firm (for apparel industry). I loved this book so much that gifted this book to one of friend who was working on textiles those days. I took the opportunity to share about this valuable book with you. Why to read this book? This book is a nonfiction novel. Authors of this book explained process management of manufacturing industry by a story. This is a brilliant book that teaches process improvement. Authors teach process management, managing bottlenecks in the production and WIP with real life studies. This is a must read book for Business owners, Industrial Engineers, Production Managers and for everyone works in manufacturing company. You will find eye opening ideas once read this book. .
You can read more reviews about the book on Amazon or Flipkart, if you are not convinced to read this book. Also See: Other books for apparel production management and garment manufacturing. Enjoy learning and enjoy improving as well.